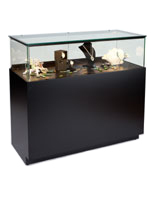 These Display Cabinets with Tempered Glass Countertop Enclosures Have LED Lights! All Grace Tyler Store Fixtures Coordinate Together! 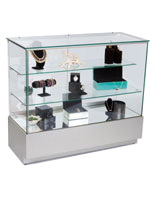 Order Display Cabinets Online for Low Prices and Fast Shipping! 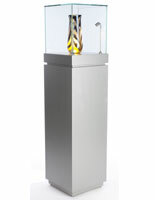 Unique "anchor" design stands alone or acts as a corner unit between showcases. 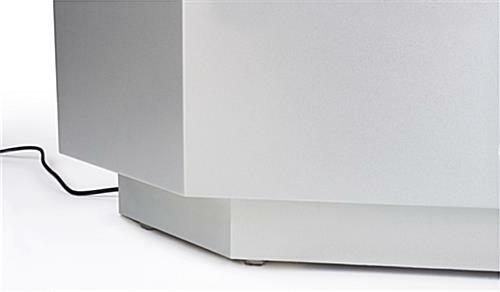 Extra-tall 42" height gives customers increased visibility, reduces stooping or bending. 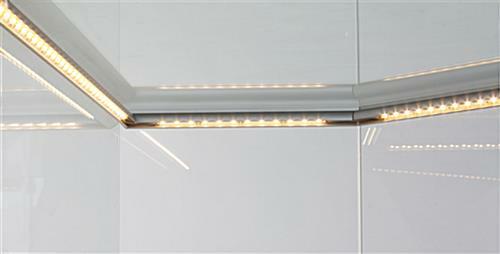 Stylish semi-gloss silver finish complements any environment. These display cabinets are 42" tall (four inches taller than other countertop store fixtures) and have an elegant semi-gloss silver finish. Each attractive retail showcase has a durable MDF base with recessed toe kick and floor levelers for stability on slightly irregular surfaces. 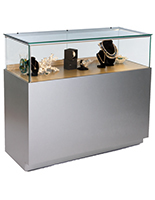 These glass-topped countertop displays, corner display cabinets have shatter-resistant tempered glass counter enclosures with locking sliding doors and built in LED lights. 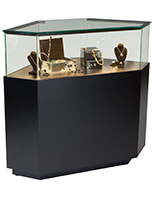 The unique construction of these stands allows them to be used as standalone store fixtures or as a corner unit anchoring multiple showcase displays. 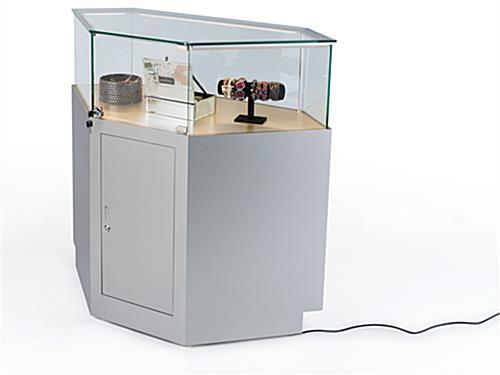 These Grace Tyler display cabinets, also known as locking retail exhibit cases, can be used with any other showcase from the same line. 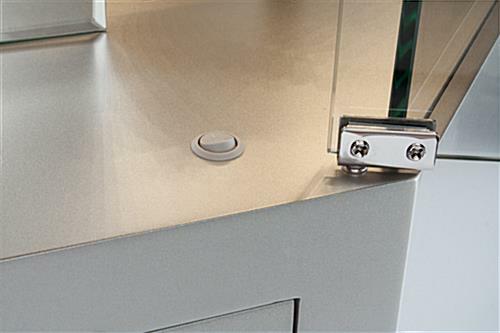 In addition to the locking sliding merchandise enclosure, each of these stands features a roomy storage cabinet in the back that also locks. 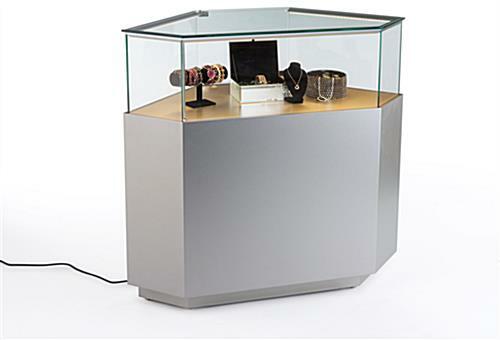 The LED lights built into the glass countertop of these store fixtures, also known as jewelry display cabinets, is energy efficient and creates soft, more natural-looking illumination than other bulbs. 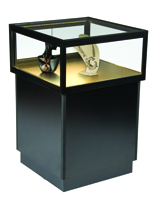 These corner cases, full vision jewelry display cabinets are versatile, stylish and economical. 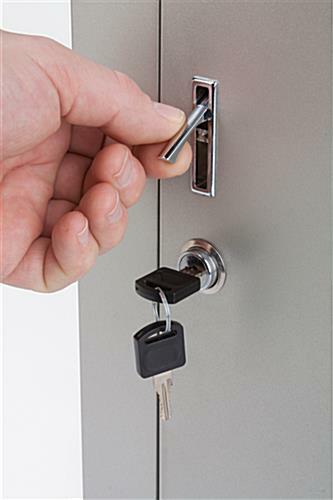 This type of locking showcase is perfect for use in any retail, commercial, institutional or even residential environment because of its elegant and simple design. 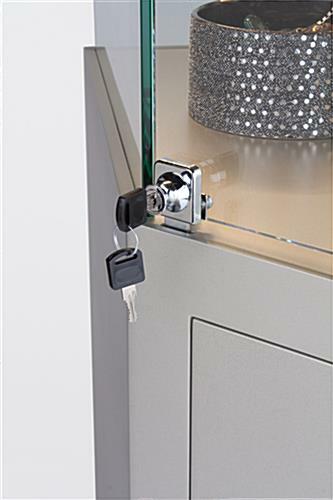 These Grace Tyler showcase enclosures, display cabinets with a glass countertop, will ship fully assembled when ordered and come with (2) keys for access to the locking merchandise and storage areas. 44.0" x 42.0" x 21.3"
43.0" x 28.5" x 20.5"